The Zoot Sports Wave 3 Wetzoot utilizes SCS Nano coating -- the most hydrodynamic and durable wetsuit coating available. 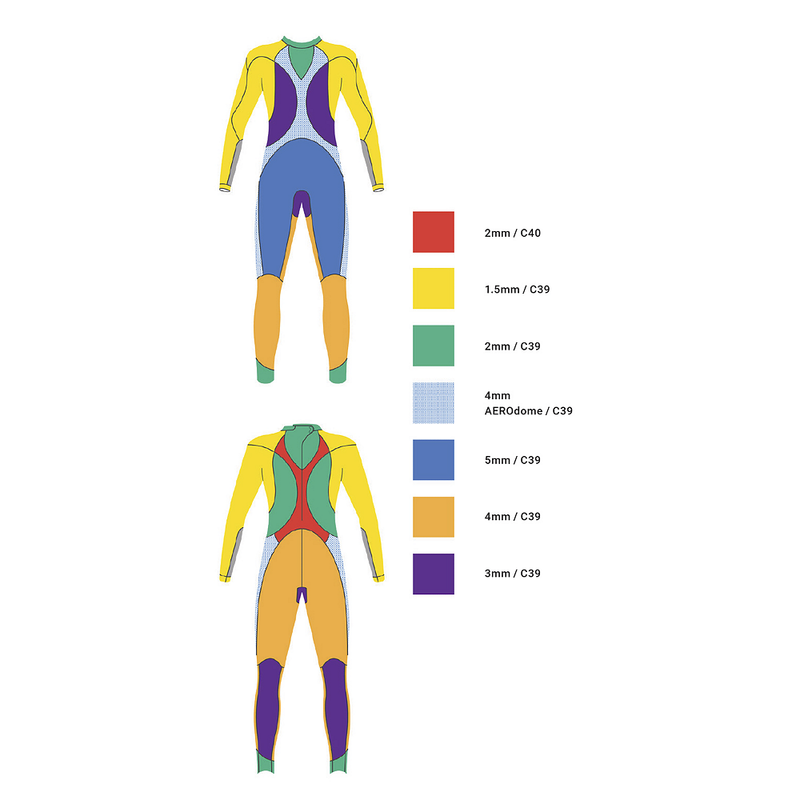 Super Composite Skin hydrodymanic finish reduces the suit's underwater coefficient of dynamic friction for less drag and more speed. The Yamamoto SCS AEROdome chest/waist panels increases buoyancy and allow for maximum flexibility. The strategically placed 2mm Speed Release Ankle Panel speeds T1 transition with its 2mm super stretchy panel at the base of the leg. The super thin neck panel with fuse welded SCS eliminates neck constriction to create an extremely low profile neck seal. It sits flat against the neck to limit water entry and stop chafing. The front chest is 3mm Yamamoto SCS Nano C39, the center chest is 4mm Yamamoto SCS AeroDome, the back body is 2mm Yamamoto SCS C39, center back is 2mm Yamamoto SCS C40, arms/shoulders/sleeves are 1.5mm Yamamoto SCS Nano C39, lower sleeve insert is .05mm, front leg is 5mm Yamamoto SCS C39, lower front leg is 4mmYamamoto SCS C39, lower leg Speed Release panel is 2mm Yamamoto SCS C39 and the seat is 4mm Yamamoto SCS C39.